Manufacturer of a wide range of products which include Battery Health Monitoring System, Solar PV Module, LED Luminaries, Solar Home System, Solar Lighting and Solar Lightning System. 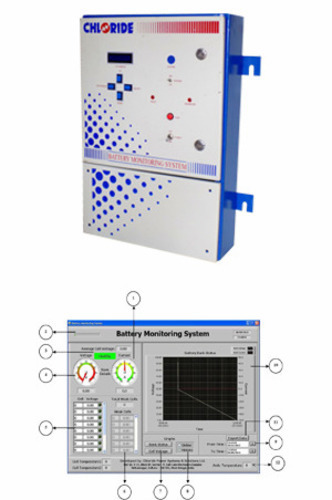 Standby battery bank in power utilities or process industries or data centres or in any mission critical application plays an extremely important role. It is the last line of defence in its electrical protection system and any malfunction of the battery at the time of emergency may result in a catastrophic disaster. It is therefore absolutely essential to keep track of the condition of the battery on a real time basis and take precautionary measure well in advance in case any cell in the battery bank is found to be developing any weakness. While many system are tried out in the industry, no mechanism / process is proved to have given fool- proof and reliable solution. This is essentially due to inadequate understanding of the behavior of a standby battery bank under different service and charging / discharging conditions. Chloride BMS addresses this age-old issue with the most reliable solution. Chloride Battery Health Monitoring System is getting popular everyday among industrial users because of its reliability and user friendly features.Recently TATA Steel and WBSETCL has commissioned Chloride BHMS for standby batteries in their substation. Solar modules use light energy (photons) from the sun to generate electricity through the photo-voltaic effect. ??? A solar photovoltaic module is composed of individual PV cells. ??? Solar module may be mono crystalline or polycrystalline. ??? Efficiencies of solar panel can be calculated by MPP(Maximum power point) value of solar panels. capacity of the solar panel and the higher value can make higher MPP. Complete system is Warranted for 2 Years. SPV Module carry 10 Years warranty. Stand alone pole mounted LED based solar street lighting systems are ideal solution for street & area lighting. Also available customized solar solution with centralized solar power system. Stand alone pole mounted CFL based solar street lighting systems with automatic dusk to dawn controller are ideal solution for street & area lighting. PWM micro controller based Solar Charge controller of rating 6-50Amp, 12, 24, 48, 96V etc is designed to utilize maximum solar energy available in the Solar Module. Designed with best aesthetic and highly efficient electronics with, available in 7watt, 9 watt &11 watt CFL and 4 – 40 watt LED based. Made up with best quality LED having Lumen out put more than 100 per watt, Available size 6 watt to 100 watt operable in AC or DC to replace, conventional HPSV or MH luminary. Made up with 7 watt CFL and with best quality 12V, 7Ah battery in the country. The design and materials are so robust that child can with this portable Lantern. Exide Solar Home light is a complete package comprising of Solar Module, Electronic Charge Controller, Battery, Cables and Light fittings with mounting and fixing hardware down to the last nuts and bolts. It provides power to light up between 2 to 4 rooms and also can operate appliances like Solar Fans, B/W TV, Colour TV, VCR, Music Systems, etc. It is your own power plant for homes, hospitals, shops, offices and camps in remote locations where electricity is unavailable or erratic. For city dwellings, offices, staircase lighting, car park etc. It is excellent as an emergency power supply. The Exide Solar Home light is an eco-friendly system, has very long life with "zero" operating cost and is virtually maintenance free. A distribution board is a component of an electricity supply system which distributes the available electrical power into subsidiary circuits, while providing a protective fuse or circuit breaker for each circuit in a common enclosure .The DCDB may also have provision for emergency DC feeder. In case of failure of AC supply, the feeder will be energized from DC source automatically. Complete system is Warranted for 3/5 Years. SPV Module carry10 Years warranty. On<3.5 Volt for 5 Min, /Off :> 4.5V Module Voltage (Available in Dusk to dawn controller only). If bat is connected into the without SPV module an error signal will be given by glowing SPV charging LED. The dusk to dawn controller is having features to prevent Battery from Deep discharge in case Module is stolen or wire is disconnected from controller. Thus during testing Modules must be connected into it. The Load is automatically cut off from Battery one the Battery voltage reached LVD. This is done to protect the battery from deep discharge. Standalone off grid for Home, Office even for whole Village. LED based Solar Home lighting for rural home is available in different package . The complete package is low cost because of low wattage LED consume less. Made up with revolutionary patented LED light source without having any glare like conventional LED light source. Stand alone and hybrid Custom built solar power plant of size 0.5Kwp – 500 KWp are available suitable for rural urban application . Custom built solutions are also available of required capacity. Stand Alone complete solar pumping system with submersible pump without battery and conventional pump with battery bank of rating ¼ HP to 5 HP is supplied and installed with perfections.